This fact sheet provides a brief overview of the Zero Suicide approach, which can be adopted by health and behavioral health care systems. This toolkit provides information and tools for developing a Zero Suicide program in health and behavioral health care systems. Zero Suicide is a commitment to suicide prevention in health and behavioral health care systems and is also a specific set of strategies and tools. The foundational belief of Zero Suicide is that suicide deaths for individuals under care within health and behavioral health systems are preventable. Zero Suicide presents both a bold goal and an aspirational challenge. Organizations that have used this approach found a 60-80% reduction in suicide rates among those in care. The foundational belief of Zero Suicide is that suicide deaths in health care systems are preventable. Who Can Adopt Zero Suicide? 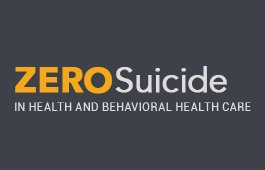 The Zero Suicide Toolkit is a collection of information, tools, resources, and activities for health and behavioral health care leaders and leadership teams to assist them in implementing the seven elements of Zero Suicide. Training and consultation in the Zero Suicide approach is available by contacting us at zerosuicide@edc.org.